In response to an invitation from the Russian Sinology Association, the Education Division of the Taipei-Moscow Economic and Cultural Coordination Commission (TMECCC) accompanied a number of Mandarin Chinese Teachers from Taiwan who are working at different prestigious Russian universities to join in an Open Dialogue: Meeting with Mandarin Chinese Teachers on October 11, 2018. Approximately 80 people from various Russian key universities and academic institutions that offer Mandarin Chinese teaching and sinology programs––including Moscow City University, Moscow State University, Moscow State Linguistic University, and the Russian State University for the Humanities –participated. The dialogue covered several areas: reference books, text books and teaching materials; curricula for college student programs and for secondary and elementary school students; and examinations to assess Mandarin Chinese proficiency. The Education Division was given permission to introduce a range of teaching materials from Taiwan and for two teachers from Taiwan to address the participants and provide feedback about teaching. 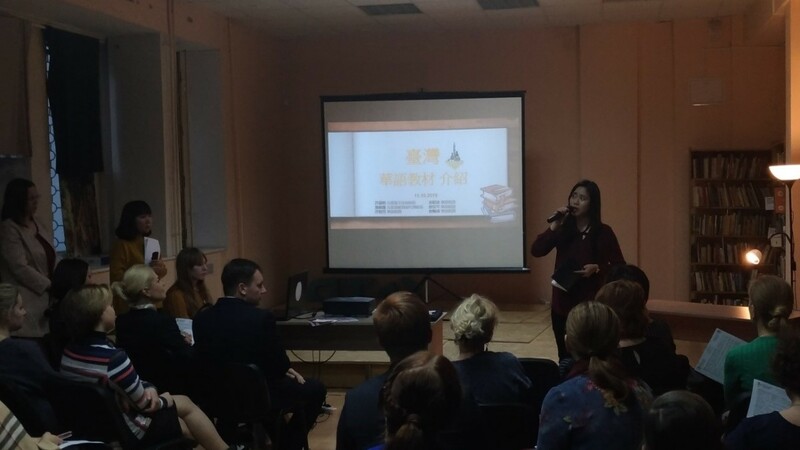 Liao Pei-Yu, who teaches at Moscow State Pedagogical University gave valuable feedback about teaching Mandarin Chinese in Russia and discussed some commonly met issues related to teaching a tonal language and Chinese grammar. She was followed by Liao Yi-Cen, who works at the Institute of Asian and African Studies at Moscow State University. Liao Yi-Cen introduced two sets of teaching materials from Taiwan: Practical Audio-Visual Chinese 2nd Edition, and A Course in Contemporary Chinese, pointing out their contemporary vocabulary, rich range of topics, and traditional Chinese characters which enrich students’ knowledge of the associated culture. The Education Division presented a display of books and teaching materials from Taiwan for participants to look through and many asked about the possibility of buying the display samples. This is very understandable given that there has been a sharp increase in the number of Mandarin Chinese learners in the past few years, in response to the Russian Federal Government decision to include Mandarin Chinese as one of the options in the Foreign Language category of the Unified National Examination from 2019. Taiwan’s participating in the Open Dialogue seminar represents taking a great step into the local Mandarin Chinese market and it has enhanced the public profile of Taiwan as a Mandarin Chinese teaching and teaching resource center. The Education Division of TMECCC is continuing to work hard promoting Mandarin Chinese, looking forward to improving Taiwan’s market share. Photo:Liao Pei-Yu, a Mandarin Chinese Teacher from Taiwan, sent to Moscow State Pedagogical University in Russia, by the Ministry of Education, Taiwan (R.O.C.) giving feedback about teaching Mandarin Chinese in Russia and some commonly met issues.